Step one is getting the kids to complain. Entrepreneurs are all about solving problems. It is not immediately clear that fourth- and fifth-graders at Westlake Elementary School, which is located near Lake Sherwood a few miles from Cal Lutheran, experience many problems. But to learn the ways of the entrepreneurship field, the children will gladly think of some. In conversation with School of Management dean Gerhard Apfelthaler, one group of four kids decides to tackle overheating of the body. Nobody likes to feel hot. As an idea for launching a business, they coalesce around a line of wearable cooling products such as scarves, wristbands and socks. Another group of three children dislikes being interrupted when busy at home. The students launch a conversation about portable potties and what accessories would be needed to make them practical for use around the home. You get the idea. With just a little encouragement, elementary school students take to the idea of launching new businesses. In fact, at the conclusion of the eight-week Start Up Kids program, they will pitch their ideas to a panel of experts, à la television’s Shark Tank, showing off a product prototype if feasible. The program is in its second year at Westlake Elementary. “It’s skyrocketed. We didn’t have the means to offer it,” said Megan Triplett, the school principal. Start Up Kids is a collaboration of local organizations that is funded in part by a grant from Cal Lutheran’s Community Leaders Association. Apfelthaler and professor Vlad Vaiman of the School of Management are among the lead instructors. Young students come with teacher recommendations or from a gifted and talented group. The program includes guest presentations by established entrepreneurs and a field trip to Cal Lutheran’s New Venture Competition. 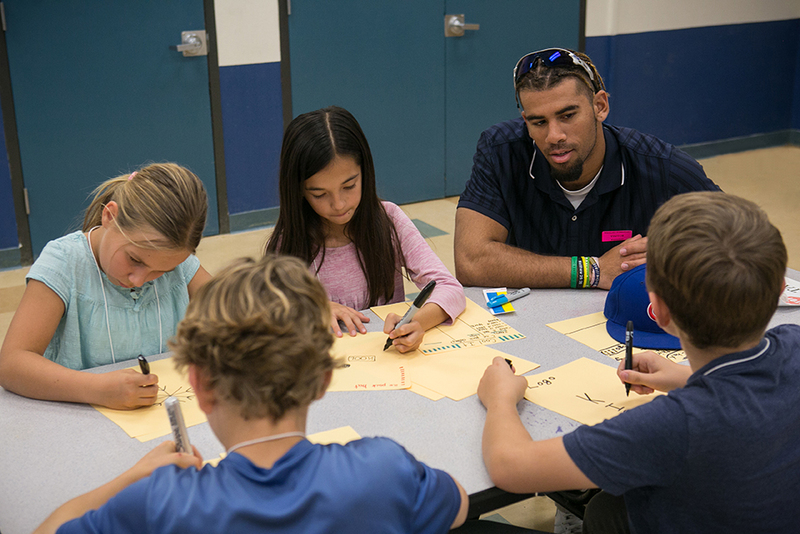 For the first time this year, Cal Lutheran undergraduates have joined as mentors who are paired with lead instructors. “Their coming in to do this contributes so much, and on a topic that the kids don’t get exposure to – that’s not part of the curriculum,” Triplett said. The undergraduates are members of a campus entrepreneurship club or have worked at Cal Lutheran’s Hub 101 business incubator near the freeway in Westlake Village. They all approach life in the way of entrepreneurs. “My dream is to have my own NGO that does education and empowerment” for women and girls in rural areas of South Asia, said Zujaja Tehreem, a junior from Ventura majoring in global studies. Tyler Lucas, a senior business major from Turlock, and Nathaniel Thompson, a senior in economics from Stockton, are partners in a web-based startup called Simple Swap, which “will be a platform that you can go on and trade your sunglasses for a video game or a couch for a chair,” according to Lucas. He’s also starting a microbrewery this summer with his father. The undergraduate instructors believe that Start Up Kids itself has potential for expansion – to middle schools as well as private and charter schools. “I definitely want to be involved with it as much as I can, because I see a big bright future in this. It can change the way fourth- to eighth-graders think,” Lucas said. For Thompson, that means taking kids beyond concepts at school and teaching them to build things. “What else you can learn from school is, ‘OK, I can use creativity and my own ideas and my own types of inspiration to get stuff going right now,’” he said.